I wasn’t quite sure what to expect from the Horizon 202 Panoramic camera. I’m very fond of panoramic photography but my experience is limited and unofficial. I say unofficial because my panoramic past come from shooting faux panoramas on compacts such as the Nikon 35 Ti, and some Pentax IQ Zooms. I have never used a true panoramic camera that exposes more than the 35mm 36×24 format - before now. The cameras I’m talking about are few and expensive, like the Hasselblad X-pan 35mm panoramic camera or the Fuji GX617 medium format panoramic camera, both of which are rarely under 3,000 USD. In fact when I picked up the Horizon 202 I knew nothing about it, and went straight into shooting without ever having researched a thing. It was very simple with only aperture and shutter speed settings with a lens locked to infinity focus. The film loading process was very difficult for me even though there was a nice little graphic embossed into the inside of the film door. Following its instructions it left the film tip buried below the take up spool which I had to ease out with a fork to be able to get my fingers on it and thread the tip into the spool. The few over-and-under repetitions of the film through the gears reminded me of years ago when I used to build up movies, splicing the reels together and threading the tip through the film projector. Big thank you to Juho and Kamerastore.com for letting me borrow the camera for this review. Cameramakers team inside the Camera Rescue Center in Finland. 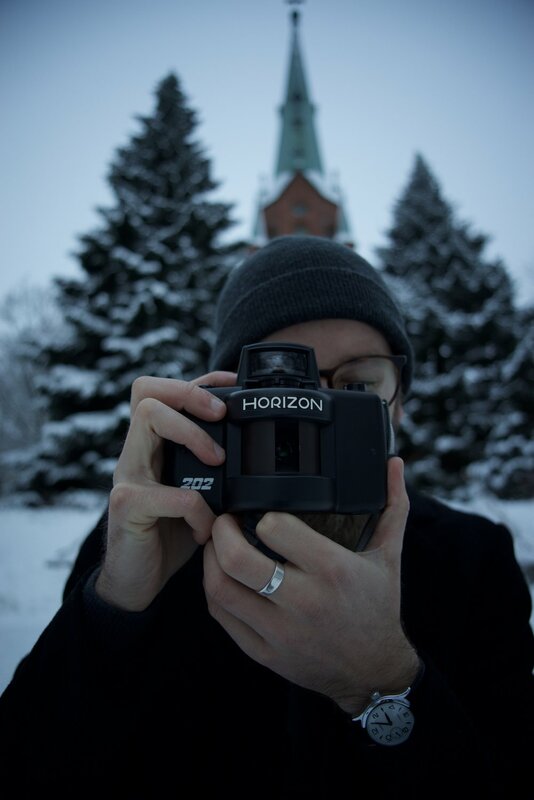 Basically I was shooting a film camera with a very wide aspect ratio in the peak of winter in Finland. One film came to mind for the job and I didn’t think twice. CineStill 800 Tungsten 35mm color film. CineStill film to respect the cinematic wide aspect ratio of the panoramic camera, and 800 speed so I could hopefully finish the roll in one day. The sun is only above the horizon around 4 hours each day in a Finnish winter. What is different about the Horizon 202 from the other panoramic 35mm cameras like the Hasselblad Xpan, is the method in which the images are made. The specialized panoramic lenses available for the Xpan capture a panoramic image from a single angle in a single instance onto a flat film plane with a field of view relative to the lens’s focal length. The Horizon 202 doesn’t have any panoramic optics, it has panoramic mechanics. The Horizon 202 has a traditional 28mm f/2.8 prime lens, housed in mechanics which together categorize the Horizon as what is called a swing-lens panoramic camera. The swing-lens panoramic system of the Horizon 202 creates panoramic images by exposing a curved film plane from one side to another, as the lens pivots or swings around its own rear nodal point with a field of view relative to the swing range of the lens (typically yielding images covering 110 to 140 degrees of width ). The Horizon 202 is an analog panoramic-stitching-machine, creating each image though multiple angles and a seamless composite as the lens rotates. It is essentially capturing what it sees as it looks from one side to the other. Displaying the 3D world onto a 2D surface has its challenges, look at the history of cartography or 15th century painters for a nice example of this. Here we have two methods of achieving that representation. Take a look below at two panoramic images, and one captured from a traditional camera onto a flat negative, and one captured on the curved film plane of a swing-lens panoramic camera. Film cameras with a flat film negative plane convey the three-dimensional world through Linear Perspective. Linear Perspective respects the illusion of depth through orthogonal lines and vanishing points. In linear perspective photography, objects which are closer to the center of the frame appear smaller. Objects near the center of the image appear smaller than those at the edges because the distance between the lens and the center of the flat negative is shorter than that of the lens and edge of the negative. Standard field of views in this method yield good results, but problems start to occur with wide and hyper-wide lenses, as objects near the edges stretch and bow. Swing Panoramic cameras with a curved film plane convey the three-dimensional world through Cylindrical Perspective. Cylindrical Perspective respects the scale of objects in relation to one another from the viewpoint. In cylindrical perspective photography, objects which are physically further away appear smaller. In reality, the car in the middle is closer and appears larger than the cars to the sides, and so the three dimensional size relationship is preserved in the two dimensional image. This method of perspective is used in 360º video and VR because it respects reality, the illusion of depth is then achieved through parallax (I think - This stuff is complicated!). There is also Spherical Perspective and a few other less-used ones. Each type of perspective has it uses and drawbacks. For example, drawing or photographing the entirety of an infinitely long fence would be impossible using Linear Perspective. When looking inside the back of the camera, you can see a small vertical slit in the rotating drum behind the lens where the light pans across the film exposing it in a sweeping, swinging motion. This acts as a shutter and the rate of rotation acts as the shutter speed. With the vertical opening at midpoint of the lens, the entirety of the image is created with light entering perpendicular to the film plane and not at an angle. In theory this should produce sharper images and with less lens related aberrations than a standard non-moving or panoramic lens. The center of the frame produces sharper results than on the edges of the frame. Personally I don’t care much about sharpness, but it is an image entirely exposed with the center-sharpness a lens is intriguing to me. Take that Xpan! With a traditional camera light rays contact and expose the film at all angles within the field of view, on a swing-lens panoramic camera light rays contact and expose the at roughly only one 90º angle. I think this is in some way related to or akin to the physics of light polarization, where light rays can only pass through on a single axis parallel to the filters chain molecule pattern. I would love to hear your thoughts on this if you see any connections. The shooting experience of the Horizon 202 camera was very limiting yet enjoyable, and it quickly showed me where it got its name from. When looking through the viewfinder two things are seen, a massively wide horizontal field of view that cannot be understood without moving your eye from side to side, and just below that, a large mirror that lets me view bubble level - or spirit level, mounted on top of the viewfinder, illuminated by the daylight though its translucent plastic shell. When composing an image from a normal camera, each composition is made by choices in distance, focus, height, rotation, tilt, and pitch. How far to be from the subject, what distance to focus, how high to be from the ground, whether to shoot level or tilted, and aiming up or down - these are all choices we can make in a normal situation. The horizon strips away most of these and shooting has a feeling of operating a 2D world, like being a rook or a bishop with a camera. I can’t change focus as it’s set to infinity, and the bubble suggests I shouldn’t tilt up or down, and I also can’t raise the camera above my eye-level, because I can’t read the bubble level. I can only move along my the ground and turn my body. Well would you look at that, it’s almost like this camera will only allow me shoot whatever lies on - the horizon! I know this is not a revelation to most of you and I am late to the party, but as I said I did not know anything about this camera before shooting it. Even pushing the shutter button with my index finger was highly uncomfortable, the button was set way too far back on the top of the camera behind the viewfinder. On one shot I took, I wanted a low angle to get the framing right, with the bubble level on top of the camera it was easy to compose without the viewfinder up to my eye. From this position I moved my right thumb over the shutter button and all at once I saw and felt that that is how I was supposed to be shooting, the Horizon shutter button was designed not for my finger but for my thumb, shooting from the hip. I hope you are with me so far, I’m not having negative feeling about this camera. All of these limitations of the camera, they were not limitations but suggestions - a guide. Every move I made that was not in-line with the camera’s strengths was met with feedback suggesting I think twice about what I was doing. I was getting instructions every step along the way, the camera’s design itself was the user manual. Shooting with the Horizon 202 panoramic camera is a constant conversation; an idea, a rebuttal, a compromise, a solution, and an understanding. On one occasion I really wanted a higher perspective that I just could not get. I wanted to center a small wooden structure half on the snow covered shore and half the ice covered lake. Holding the camera level with the ground would have cut off the top of the building. So I opted to try for a trick I first discovered when shooting my Pentax LX with the waist finder attachment - shoot it over my head, backwards, and upside down. The camera wasn’t designed for this and the bubble level settled into a position while upside down that made it very difficult to interpret it. I didn’t get it perfect but I got close enough to the shot I wanted. I’ve heard about people finding many or all of their Hasselblad Xpan shots coming out crooked. When shooting the Horizon 202 I would first compose my image, and then make fine adjustments to make sure it was straight according to the bubble level. Every time I thought the image was straight, the bubble level told me it was crooked. Every time I got the camera leveled with the bubble, the image appeared crooked to my eye. I think my skewed perception through the Horizon and other photographers crooked Xpan pictures are related. My guess is that viewing such a wide view with only one eye (without parallax), hinders the brain’s ability to judge what is level. Or it’s just hard and I’m not good at it. It’s also fun to talk with friends and theorize what the image would through further experimentation with the camera. For example a friend and I calculated that if you were able to spin 240º from left to right during the duration of an image exposure, you would capture near the equivalent of an uncompressed anamorphic (cinemascope) 360º panoramic image. And if the camera is pointed upwards, the horizon line is bent convexly, with the left and right side lower than the center. What if you were able to perfectly counter that distortion by starting with the camera tilted to the right, and ended the exposure with it tilted to left? Would you have just created the equivalent of a shift-panoramic lens? The Horizon 202 camera has a lot to offer to many different types of photographers. It’s big and strange and heavy, but if you like panoramic, landscape, medium format, or experimental photography; even cinematography, lomography, or making large prints, this camera is something you will probably enjoy. I think it’s great that there are cameras that enable a photographer to shoot in literally a different perspective then they have probably been shooting their whole life. If you want to buy this camera it might still be available at Kamerastore.com. Personally I would own this myself if it wasn’t so large. My style is rangefinders and pancake lenses. There’s just no room in my bag for this bulbous beauty. I got about 20 pictures out of a normal 36 exposure roll - the rest of the images below.